Celebrate creativity and landmark achievements by women writers. This annual event is a benefit to support the creative writing programs of WriteGirl. The Bold Ink Awards were created to honor the women writers who inspire our girls, our mentors, and audiences around the world. Each year, we seek out storytellers whose voices move us and who are creative role models. We honor writers in various creative writing genres. Their achievements mark the degree of excellence we all strive for. They write in Bold Ink. The 6th Annual WriteGirl Bold Ink Awards on November 5th was a huge success! The Eli and Edythe Broad Stage in Santa Monica was the perfect location for this memorable event, which included inspiring remarks by our honorees Melissa Rosenberg, Lisa Cholodenko, Kami Garcia, Margaret Stohl and Zoe Kazan. Guests mingled under the night sky and bid on an incredible selection of auction items, while enjoying an array of hors d’oeuvres and beverages from local restaurants. On the red carpet: presenters Chris Messina, Edi Gathegi, Tahereh Mafi, Ransom Riggs, Elizabeth Sarnoff and celebrity guests Aasha Davis, Trevor St. John, Molly Quinn, Michelle Shocked, Janet Robin, Dawn Prescott and Toni Graphia. …I think the honorees were sincerely awed by WriteGirl, which translated to those in the audience as absolutely inspirational. I loved meeting Glenda, the young Fulbright scholar who spoke. I think she really brought home the work that WriteGirl truly does. This is an amazing honor, all the more amazing because it's from you guys." What a lovely -- and inspiring -- evening! I was delighted to be a part of it." Funniest awards event I've ever been to. It felt warm and real. It truly felt like a WriteGirl event. Writers Guild of America Theater. The 2011 Bold Ink Award honorees, left to right:Nia Vardalos (My Big Fat Greek Wedding, I Hate Valentine’s Day), Sarah Silverman (The Sarah Silverman Program, Bedwetter), Winnie Holzman (Wicked, My So-Called Life), Savannah Dooley(Huge), Aline Brosh McKenna (The Devil Wears Prada, 27 Dresses), and Kara DioGuardi ("Ain’t No Other Man", "Walk Away", "Undo It"), with WriteGirl founder Keren Taylor. Pictured left to right: screenwriter Elizabeth Sarnoff (honoree), actor Robin Weigert, California Poet Laureate Carol Muske-Dukes, screenwriter Robin Swicord (presenter),Lynda Resnick(honoree), WriteGirl Executive Director Keren Taylor, novelistMarisa Silver(honoree), L.A. Times Book Editor David Ulin (presenter), poet Patricia Seyburn (honoree), screenwriter Nancy Meyers (honoree), and screenwriter and WriteGirl volunteer Clare Sera (emcee). 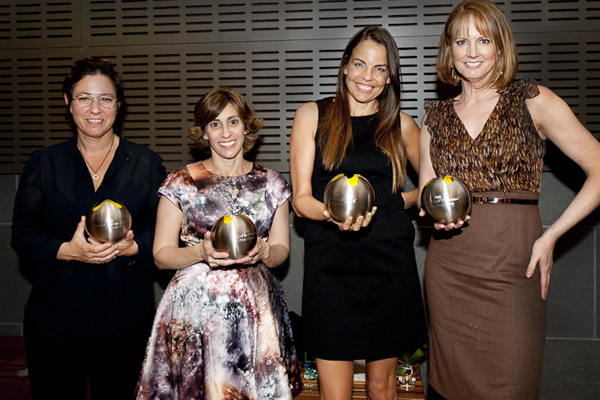 2009 Bold Ink Award Honorees: Pictured left to right: Best-selling novelist & screenwriter Gigi Levangie(The Starter Wife, Maneater), Pulitzer Prize-winning journalistSonia Nazario (Enrique's Journey). Academy Award nominated screenwriter Naomi Foner (Bee Season, Running on Empty); Grammy winning songwriter Diane Warren("Because You Loved Me", "How Do I Live"), WriteGirl Executive Director Keren Taylor; screenwriter/director Gina Prince Bythewood (The Secret Life of Bees, Love & Basketball), acclaimed poet Wanda Coleman (Jazz at Twelve O'Clock Tales: New Stories), Emmy nominated television writer Jennifer Crittenden (The New Adventures of Old Christine, Everybody Loves Raymond) (Not pictured: Bold Ink Honoree, novelist Carolyn See). Pictured, top left to right: 2008 Academy Award-winning screenwriter Diablo Cody(Juno); Academy Award nominated screenwriter Robin Swicord (The Curious Case of Benjamin Button); WriteGirl Executive Director Keren Taylor; Writer/Producer Sarah Fain (Dollhouse); 2009 California Poet Laureate Carol Muske-Dukes (Channeling Mark Twain); Liz Craft(Dollhouse); Mona Simpson(Anywhere But Here) Bottom row: WriteGirl teen authors. Not pictured: Calle Khourie (Thelma & Louise); LA Times Columnist & NPR commentator Patt Morrison. 2006 Bold Ink Award Honorees: Back row, left to right: TV writer/producer Carol Flint (ER, The West Wing); TV & memoir writer Jill Soloway(Six Feet Under); NPR journalist/author Sandra Tsing Loh. Front row: Author Janet Fitch (White Oleander); WriteGirl Executive Director Keren Taylor; poet Suzanne Lummis (In Danger). WriteGirl is grateful for support from many companies and individuals who generously support the annual WriteGirl Bold Ink Awards. If you would like to become a sponsor at this year's event and be featured in the event’s booklet, pleasedownload an application form here (PDF) and email it to events@writegirl.org or fax to 213-253-2618. The Bold Ink Awards benefit our creative writing and mentoring program for at-risk teen girls.